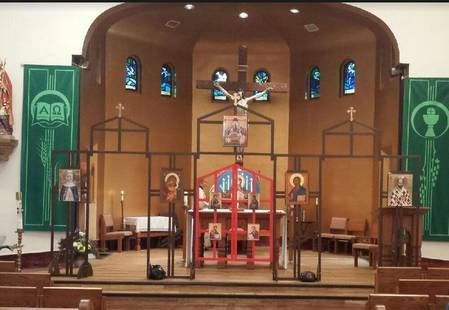 We meet in a Roman Catholic Church so we needed an icon screen that was easy to assemble and does not take up much storage space. This is a picture of our icon screen. It takes less than ten minutes to set up and can be stored in a small closet. It is light weight and easily assembled. Far from traditional but, given the situation and the circumstances, I think it's remarkably done. Kudos to whomever came up with the concept! I agree with Neil. It allows the congregation to see the Liturgy. I think this is a great idea! So many Roman Catholics know little or nothing about the Eastern Catholic Churches and about their very beautiful and sacred Liturgies. A portable icon screen would allow R.C. 's to view and participate in the Divine Liturgy. This is extraordinary. How long have you been meeting in this parish? Hello from San Antonio. We drove home yesterday from Houston and it was 223 miles. Another 550 miles and we could have been in your city for a visit. The size of Texas is beyond description. We will have completed our eighth year in March. In that time we have moved six different times. Our weekly attendance for Liturgy is between 40 and 50. With this iconostasis we have been able to pick up and move rather easily. We are a community of mostly young families from a number of different Greek Catholic traditions. We have applied for mission status but now are an outreach of St. John Chrysostom BCC in Houston. Since our former chaplain, Fr. Ramon Gonzalez, a biritual Dominican priest, was transferred to Memphis by the Dominicans, we have be served by Fr. Elias Rafaj from St. John Chrysostom and Fr. Deacon Jeff Mierjewski from Austin. Fr. Elias drives over every other week to serve Divine Liturgy on Saturday evening at 4:00 PM. Fr. Deacon Jeff drives down from Austin the other weeks to serve Typika with Holy Communion. We will have Christmas Liturgy of the Hours on Sunday night December 22 at 6:00 pm and our Nativity Divine Liturgy will be on Monday December 24 at 4:00 PM. If you ever get to San Antonio please join us. By the way. We now have a relatively stable meeting place so Fr. Elias is arranging for us to have a more traditional iconostasis next year. We will probably retire this one then. If any outreach or mission can use it contact me and we can see if we can arrange to get it to you.